Robert Baldwin was born on March 17, 1933, in Sona Bata, Belgian Congo. He enlisted in the Vermont Army National Guard on December 20, 1949, and served as an infantryman until receiving an honorable discharge on August 26, 1950. He was commissioned a 2d Lt in the Air Force Reserve through the Air Force ROTC program on August 17, 1955, and went on active duty beginning June 11, 1956. 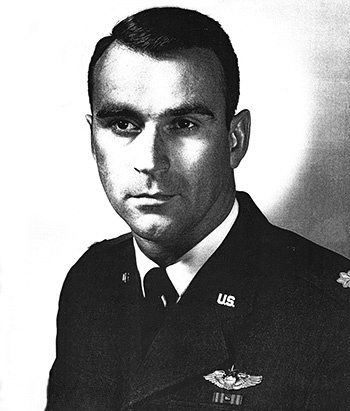 Lt Baldwin next completed Undergraduate Pilot Training and was awarded his pilot wings at Vance AFB, Oklahoma, in September 1957, followed by helicopter pilot training at Randolph AFB, Texas, from September 1957 to March 1958. His first assignment was as a helicopter pilot with the 1st Operations Squadron and the 1st Fighter Group at Selfridge AFB, Michigan, from March 1958 to December 1960. He then completed Experimental Test Pilot School at Edwards AFB, California, before serving as a helicopter flight test officer at Edwards from September 1961 to May 1966. 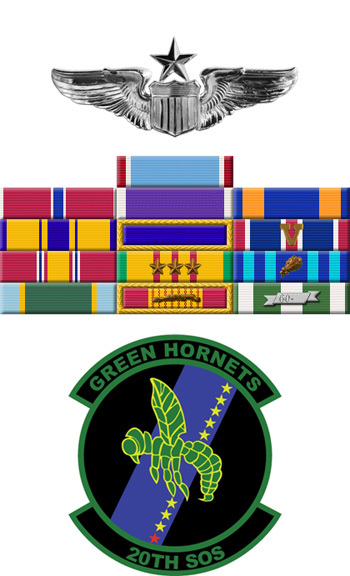 Maj Baldwin deployed to Southeast Asia in May 1966, and served as a UH-1 Iroquois pilot with the 606th Air Commando Squadron at Nakhon Phanom Royal Thai AFB, Thailand, from May 1966 to February 1967, and with the 20th Helicopter Squadron (later redesignated the 20th Special Operations Squadron) from February 1967 until he was killed in action over Laos on March 31, 1967. Robert Baldwin was buried at the Fort Rosecrans National Cemetery in San Diego, California. Major Robert L. Baldwin distinguished himself by extraordinary heroism in connection with military operations against an opposing armed force as a UH-1 pilot on 31 March 1967. On that date, Major Baldwin volunteered to pilot his unarmed helicopters to evacuate severely wounded American ground troops under heavy hostile fire. Despite intense and accurately directed automatic weapons fire which severely damaged his aircraft and inflicted serious wounds upon his person, Major Baldwin, with undaunted determination, indomitable courage, and professional skill, successfully delivered ammunition and water to the beleaguered ground forces and began rescue of wounded personnel. Again devastating ground fire struck his aircraft, causing it to crash. Disregarding his own serious wounds, Major Baldwin attempted to save the other wounded until his loss of consciousness prevented any further action. Through his extraordinary heroism, superb airmanship, and aggressiveness in the face of hostile forces, Major Baldwin reflected the highest credit upon himself and the United States Air Force.